This week has started to tug at my heart a bit as I am heading toward my 3rd Mother’s Day without my 2 babies in my arms. I will talk more into some of my insights and how I will honor my angels and still celebrate that I am a Mother on May 8th, regardless of whether you can see I am a mother or not, but not today. Today got me thinking. I was starting to mull over what Anthony and I could do to make Mother’s Day special for us and how we would celebrate the special day as it means a lot to us. And as I was thinking all of this, I found out that a friend’s mom died this weekend and at a young age. Aaaaaand that’s when I realized I needed to take a step back. Mother’s Day hurts. It hurts because my angels are not with me. It hurts because my friends receive handprint cards and other pre-k handmade memorabilia and sloppy kisses and other special things straight from the hands of their babies. All of these things and more hurt, but what about those who find themselves without their own mom on Mother’s Day? My own mom lost her mom when she was younger than I am now. I am lucky to still have her. I even still have one of my grandmother’s living today. So while Mother’s Day has been tough for me, there are certainly many out there who cannot call their mother to say “I love you” or send a card, or have a chat on the porch. So in all honesty, an adjustment of perspective will help in celebrating Mother’s Day this year. I still get to have my own mom here with me. The little chats I probably take for granted more often than not are what some people would give anything to have. One last hug, one last phone call, one last anything. Who loves simple, no hassle dinners? Everyone I would assume. I have been on a mission to create some easy one pot recipes for dinner lately. When it comes to a pasta dish, I feel like there are so many pots and pans I end up with before the end of things, that the one and done mentality has been amazing. 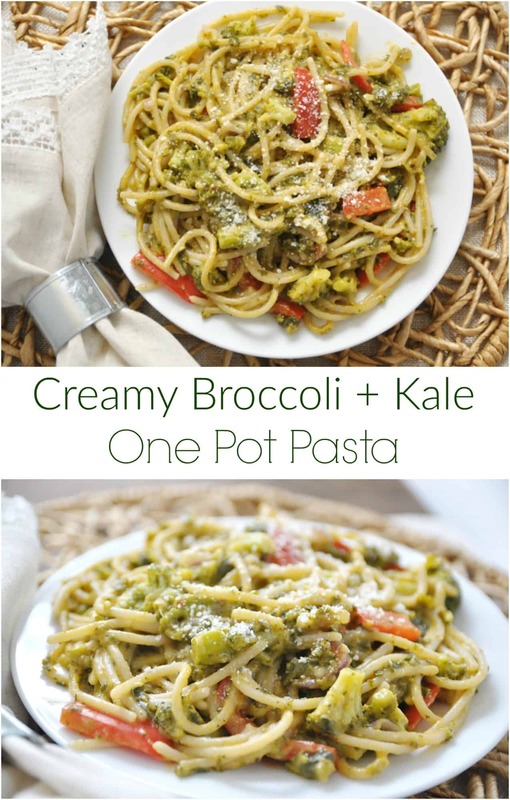 This Creamy Broccoli + Kale One Pot Pasta prep time can be made super simple if you are in a time crunch by using frozen chopped kale and frozen broccoli. If you have time to do it fresh, then do it! Pack lots of veggies into this one without much fuss. Make it spicier if you like the extra kick. I used Greek yogurt, but real cream will work fine as well. You can use a plain nondairy Greek yogurt if you can find one with minimal flavor if you are looking to make this dairy free. As for this and many pasta recipes, I find that the flavor the second day is sometimes better than the first time. 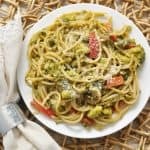 I loved leftovers with this pasta dish! In a large pot, heat 1 T olive oil on medium-high heat. Add in garlic and onion, and sauté until onions start to become translucent. Add all other ingredients except the cream/yogurt to the pot. (Break spaghetti in half so that it can all be submerged into liquid. Bring to a boil on medium-high, stirring occasionally. Allow to boil for about ten minutes until pasta is tender and the liquid begins to become absorbed and very little is left. Turn heat to low and stir in yogurt or cream. Allow to warm and blend with the pasta. Add more seasoning to taste and then remove pot from heat and allow to sit for about 3-5 minutes before serving. Garnish with fresh parsley, cheese of choice or eat as is! If the pasta does not seem to be cooked to your liking but liquid is almost fully absorbed, add more vegetable stock or water, approx. 2-3 T at a time. Serve this with diced grilled chicken and stir in at the very end! Lorie, you are a mom. Blessings to you this Mother’s Day! ?